JOIN ONE OF OUR TEAMS - Meet new people, make new friends! PLAY 11 ASIDE FOOTBALL - PLAY THE BEAUTIFUL GAME! 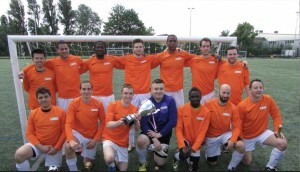 Apart from having a casual football network, the South London Football Network (SLFN) has several 11 aside football teams, playing competitively in local leagues. The good news is, FC SLFN are expanding, We are forming 2 new football teams. We already have FOUR existing teams & we are usually the first point of contact for players who are new to London, or fancy a switch from their existing club. Once you sign up, you will be sent an email with instructions on what to do next. Basically, you can start playing 11 aside for one of our teams from this weekend. We will get you playing immediately with the minimum fuss. Because you love football, and we can get you playing straight away with minimum fuss, regardless of ability, fitness level or commitment. We have several teams, so we will fit you into a team that matches your ability and fitness, or the team where you make the most friends! Once you sign up ,you will be eligible to play in one of our league teams, you will also be given up to 40% off each and every casual game in midweek too. You will also have the opportunity to meet lots of people like yourself, who are looking to get back into football, or are new to South London. Which leagues do the FC SLFN teams play in? We play in the Wimbledon & District league on a Saturday and Southern Sunday league on a Sunday. We play at 1:30pm on Saturdays and 10:30am on Sundays. You can play for either our Saturday or Sunday team, or both! We play our games in Earlsfield, Wandsworth, Southfields, Wimbledon, Clapham, Tooting, Putney, Dulwich and surrounding areas. Do you play on grass, is it 11 aside, and is it competitive? Yes, we play on grass, and we play in leagues against other teams. This is not casual football, it is actual 11 aside Saturday afternoon or Sunday league football. What is the miniumum age you need to be to play? We are an ADULT MALE football club, and the ages of our players range between 18 and 45. We do however, consider recruiting the ages of 16-18 depending on ability. We currently have no trials between now and the deadline, we have several teams, so once you come down, we can place you in a team with a group of lads that match your ability and fitness. We have so many players who are new to London, whether you are from Scotland, Ireland, Manchester, Yorkshire, Birmingham, Italy, Spain, Australia, South Africa, New Zealand, Romania or Poland, you will probably find people with the same background as you in our club. Not only are we a football club, but a social network, where you will find friends for life. We believe in giving everyone a chance, and giving everyone a warm welcome. Which days do you play on? The good thing about FC SLFN is that we have both Saturday teams and Sunday teams. We are very flexible. As we have more than one team, we have several midweek training sessions. You have a choice of attending Tuesday evenings at Southfields, Wednesday or Thursday evenings at Southfields Academy . Not at all. We understand that living in London is busy, so we do not expect you to commit to playing every week. We normally have a 70% commitment rate, and we totally understand people cannot make it everyweek on a solid basis. You will not be penalized for this. Can I join without coming to a trial? Yes, you absolutely can. We have several teams, so once we have seen you play at training, we can place you in one of our teams that matches your ability & fitness level. Obviously, if you are very good, we will invite you into our first team. If you need to brush up on your fitness, then you can start off in one of our reserve teams, and work your way up. We have FA qualified coaches, who can not only improve your fitness, but also help improve you as a player. How good are the FC SLFN Teams? Obviously, without seeing you play, we cannot give you an accurate measurement of how good our teams are. Like we mentioned before, we have several teams, with different ability levels, so all we need to do is see you play, and then we can advise the team which is best for you. Can you get me fit? Yes we absolutely can. Apart from a choice of 3 training sessions per week. ( Dont worry you dont have to attend all ) We have a casual football network, which will allow you to play football for fun, this will not only allow you to brush up on your fitness, but on your skills too. It is also a great way of meeting new people. I'm not going to be able to train every week, is this a problem? Not a problem at all, we understand that from time to time, things will come up. So we are very understanding with issues like this. You can choose your commitment level, and play according to what matches your lifestyle. We will of course place you in a team that matches your ability and commitment level. What's the SLFN Social scene like? Our social scene is excellent. We have an annual Christmas night out, poker nights, and quarterly banter nights in Claphan & surrounding areas. We also travel to Europe every summer for football tournaments. We went to Berlin & Copenhagen last year, and we are just preparing for a European tournament in Austria in July. Is there a signing on fee? The average signing on fee in the UK, is £100. Our signing on fee is just £14.99. Once you join us you will also be eligible to up to 40% off casual games too. So, not only do you get to play league football, the casual football will also be open to you with massive discounts. How much is it per league and cup game? Thanks to the discounts we offer all the sessions are just £7.99 per person, this includes league and cup games . The average price in London to play 90 mins for a team is £10, so again we are very proud to have kept our prices low. Pitch hiring and referee fees are very expensive in London, as well as washing kits, and equipment purchase, but we do work hard to keep prices as low as we can. You are welcome to take advantage of our discounts and start playing this weekend. I'm not very fit at the moment, can I still join? Yes, you can. Why don't you try playing a few games in our casual football network,, we will get you even fitter. We have not answered your question, what to do next? Unless a player pulls out or leaves the club or we open up more spaces, then NO you cannot register after the deadline, so if you are serious about playing, please join before the end of the deadline so we can complete your admin and registration. What are you waiting for? Click one of the buttons below to sign up now! There is a VERY HIGH demand for 11 aside football in SOUTH LONDON and not enough teams are recruiting, so please register early so you DO NOT miss out. Our teams are very popular, and once we are full, we cannot recruit any further players, because of squad limits. PLEASE REGISTER EARLY TO GUARANTEE YOUR PLACE.